It's an Odyssey really, but they spell it their own way. When the ocean comes to the desert, you want to share it with everyone. Odysea is the largest aquarium in the Southwest, spanning 200,000 square feet and home to sharks, turtles, penguins, jellyfish, octopus and a whole slew of sea creatures that'll blow your mind (and your eyes). They came to us needing an awe-inspiring oceanic experience that would enhance and immerse websurfers and get them to become real life visitors. A digital experience to reflect the technological advanced aquarium they were building. A selling system in place to capture ticket sales at the right moments as people are scrolling through the site and it needed to translate across all screen sizes. 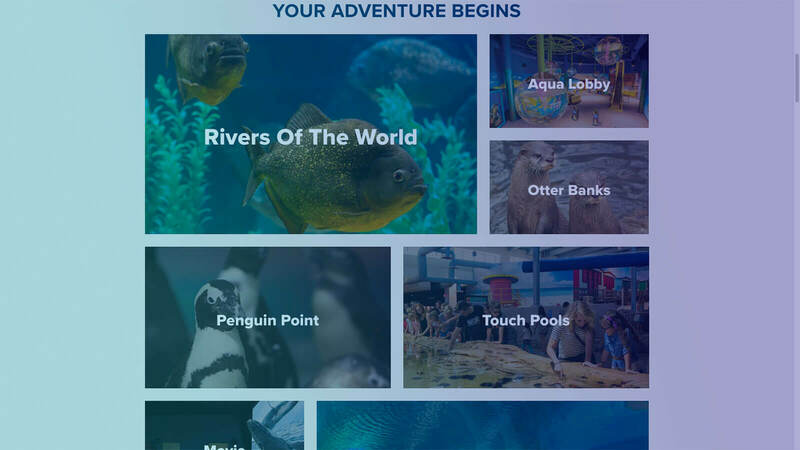 A way to showcase the aquarium's attractions that would grasp at the curiosity of potential visitors and ultimately convert them into patrons. With 70% of OdySea's site visitors scrolling on their smartphones and tablets, you best believe we needed this ditty to be a mobile workhorse. We don't just produce ingenious designs, we also write optimized code for everything to work perfectly... but it all starts with a wireframe, that's the birth of all our creativity. And, those elements aren't just a part of the process, it's the essence of our approach to our work. There are so many other strategic moments that fit in before, between and after a wireframe is done... Like an eight way ice cream sandwich. In the beginning and in the end, the digital experience is a stair step to the live experience. With 1 Million + site visitors translating into 250,000 aquarium experiences in the first 6 months, people from near and far are experiencing this OdySea in the Desert. The OdySea Aquarium is located in Scottsdale, AZ and is now open to experience daily.